After its impressive finish in the Asian TV Awards late last year, TV5 is set to conquer international recognition yet again after earning two nods at the prestigious New York Festivals TV and Film Awards scheduled this April. Wanted – Child Special (hosted by Raffy Tulfo) is a finalist at the Community Service Programs category, while NEWS5 Debates – Hamon sa Pagbabago (A Challenge For Change) hosted by NEWS5 chief Luchi Cruz-Valdes, Atty. Dong Puno and Paolo Bediones is listed at the Politics category. The two Kapatid programs from the network’s news and information division will be competing with other programs from over 40 countries. 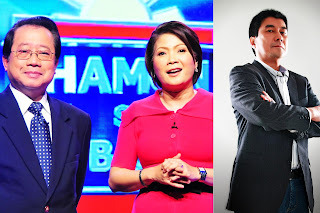 Since its major relaunch last March 2010, the Kapatid Network has been on a winning streak in terms of viewership and recognitions—most notable of which was its Asian TV Awards trophy for Star Confessions last December 2011. Two other Kapatid programs—Talentadong Pinoy (Best General Entertainment category) and Lokomoko (Best Comedy Programme category)—competed in Asia’s most prestigious award-giving body—making TV5 the most competitive Philippine TV network in the Asian TV Awards last year.